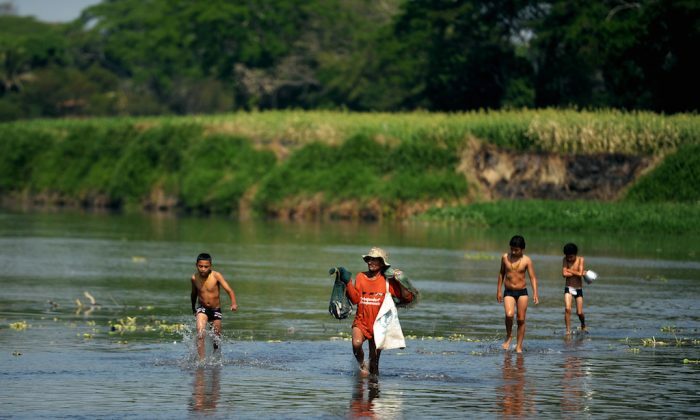 Nearly 30 years ago, the Wisconsin-based Commerce Group Corp. purchased a gold mine near the San Sebastian River in El Salvador and contaminated the water. Now, according to Lita Trejo, a native Salvadoran and school worker in Washington, D.C., the once clear river is orange. The people who drink from the arsenic-polluted river, she says, are suffering from kidney failure and other diseases. On Sept. 15, Trejo and more than 200 protesters—including Salvadoran immigrants, Catholic priests, trade unionists, and environmentalists—gathered in front of the World Bank to support El Salvador’s right to keep its largest river from suffering the same fate as the San Sebastian River. The event was co-sponsored by a raft of organizations, including the Institute for Policy Studies, Oxfam America, the AFL-CIO, the Teamsters, Friends of the Earth, the Sierra Club, and the Council of Canadians, among others. Over the past few weeks, similar protests have taken place in El Salvador, Canada, and Australia. John Cavanagh, director of the Institute for Policy Studies, explained the goal of the protest: “We are saying to OceanaGold: ‘Drop the suit. Go home.’ To the World Bank, we say: ‘Evict this unjust tribunal. It deepens poverty and stomps on democracy and basic rights. '” Cavanagh pledged to continue pressing the company to back down, promising that protesters would return to the World Bank in larger numbers when the tribunal makes its ruling in 2015. Diana Anahi Torres-Valverde is the New Mexico fellow at the Institute for Policy Studies. This article previously published at FPIF.org.